Iran is one of my favourite countries that I have visited. It is home to one of the oldest civilisations in the world. It has varied landscapes, impressive architectures, stunning mosaics, great history, and delicious foods. The people are the nicest and their hospitality often surprised me. That’s why I visited Iran twice: in 2011 during my 1-month backpacking trip in the Middle East, and recently in 2017 with my beloved husband. Will I visit Iran for the third time? I definitely will! There are still many untouched places I have never been. Travelling for 15 days around Iran is not enough, although it is sufficient to get to know the country a little better. EDITED: Some people asked me: what if I don’t have 15 days? I would say, the minimum time to travel around Iran would be 7 days 6 nights, which means that you need to skip both Abyaneh and Kerman. You can take the usual travel loop: Tehran – Isfahan – Yazd – Shiraz – Tehran. 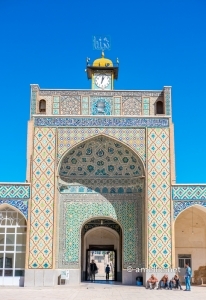 Another alternative is to do a counter-clockwise travel loop: Tehran – Shiraz – Yazd – Isfahan – Tehran. 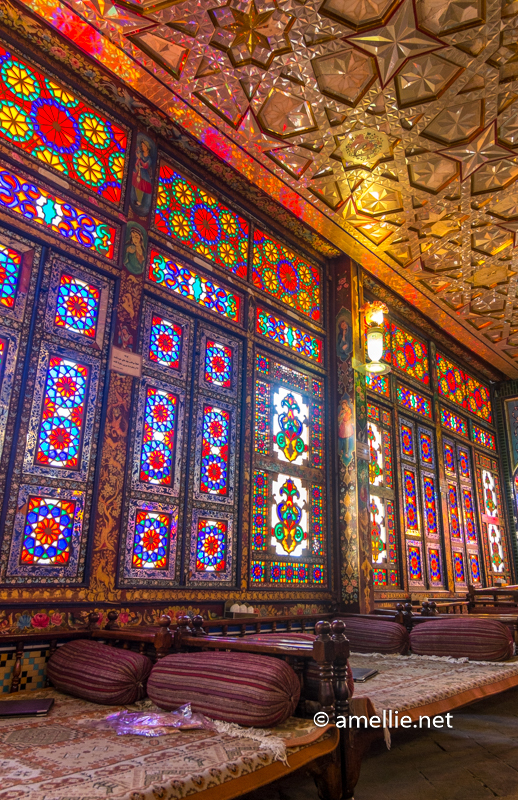 I’d suggest staying in Isfahan and Shiraz for a minimum of two nights each. For the other cities, you can either do a day trip (and take a night bus/train in the evening) or stay a night. Our AirAsia flight from Kuala Lumpur to Tehran arrived at 12 AM. We applied for a visa on arrival, which took about an hour before the visas were eventually on our hands. Since we arrived after midnight, there are no other transportation options available other than taxis. We took a taxi for USD 20 — quite expensive if you ask me! We were too tired to bargain though, so we took the offer in the end. On our first short night, we stayed at the Persian Hostel for USD 15/person for a bed in a 24-bed dormitory. As we came here in the winter season (February), we decided to go to the snowy Tochal of the Alborz Range. 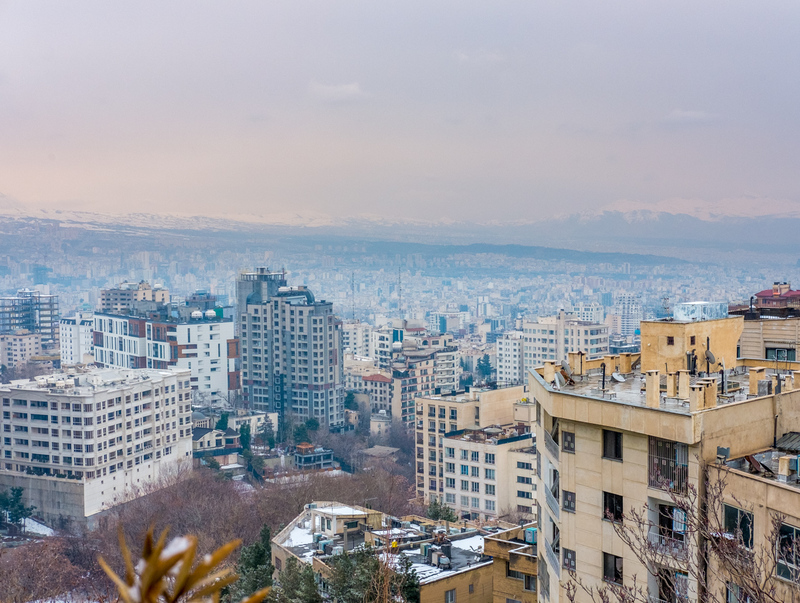 The mountain range is so close to Tehran that you can see it from most parts of the city during clear days. 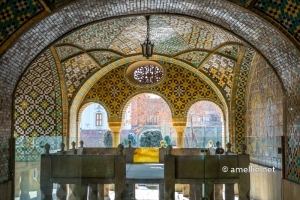 It’s also very easy to get here as you just need to go to Tajrish by metro and take a taxi for a few minutes. We spent the whole day at Mt Tochal. The initial plan was to ski but the weather wasn’t so pleasant. It was like a blizzard! So we ended up just chilling at a restaurant located at Station 5. The cost of going to the last station using the gondola was 380,000 rials (USD 11.7). We came back down from Tochal by 3 pm and went straight to meet our host. 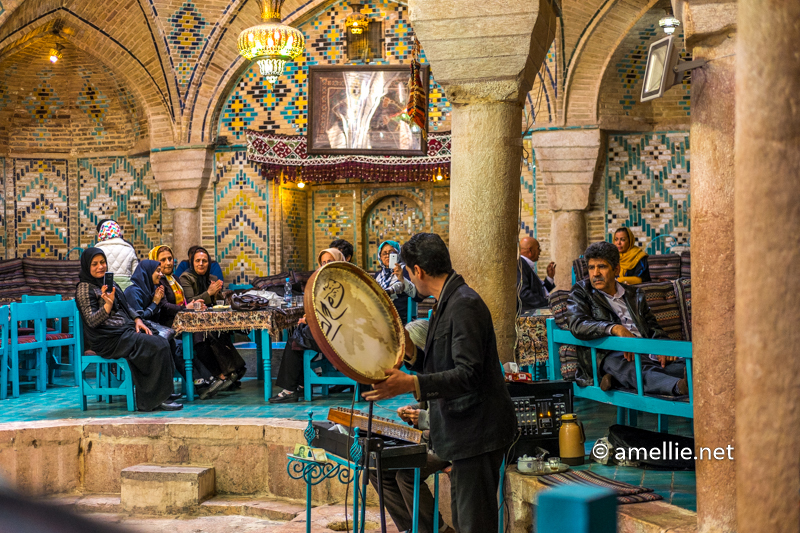 If you have time, spend an hour or two by exploring the Tajrish Bazaar and the nearby Imamzadeh Saleh Mausoleum. Tajrish is a lovely area and it’s one of my favourite districts in Tehran! Our CouchSurfing hosts, Hoda and Ali prepared dinner for us and we had a lovely time talking about many things, including Iranian cultures. Despite being a busy and polluted city, Tehran is still pleasant to explore. There are many parks, palaces, and bazaar that one can dive into. My favourite and most-worth-to-visit place is definitely the Golestan Palace. Spend a few hours here and admire its amazing tiles, mirrors, chandeliers, fountains, and garden. 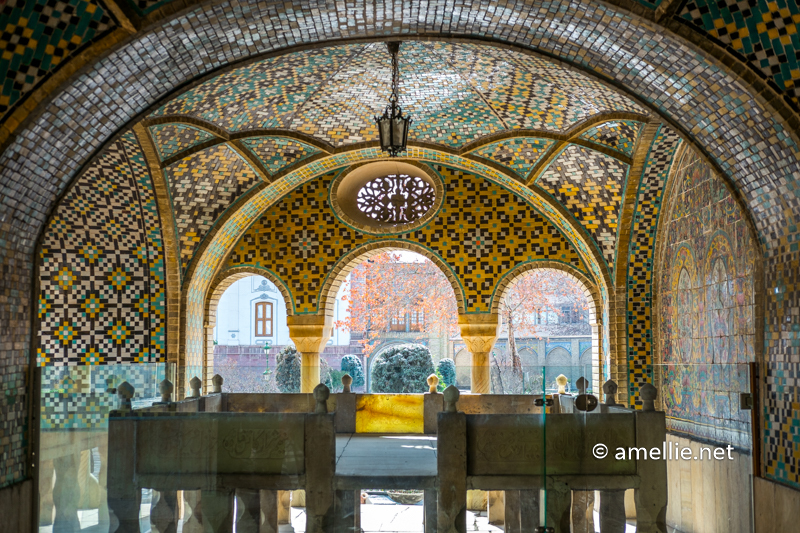 Visiting Golestan Palace isn’t complete without hopping over to the famous Grand Bazaar next door. Get lost in the bazaar and you will be amazed by what you can find! Don’t forget to taste some of the authentic local foods scattered around the bazaar. After lunch, we spent a few hours with our host Hoda and the new local friends that we met. 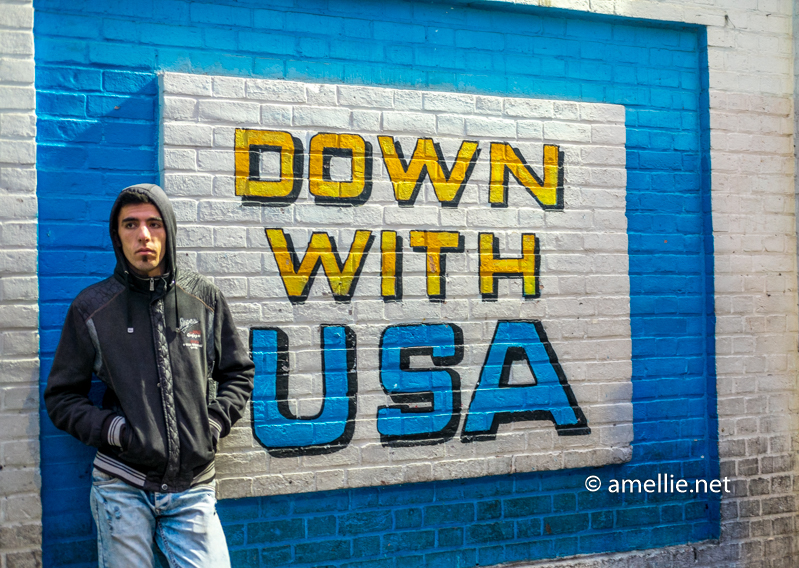 We also went to the Former US Embassy to see some interesting propaganda walls. Within a walking distance from the embassy, there is a contemporary art exhibition at the Iranian Artists Forum. We went there to have a look and it’s interesting to see that so many Iranians are really interested in this! Their art sphere is well supported by the locals, unlike the ones in Malaysia or Indonesia, for instance. Initially, we were about to search for a hostel to stay for a night as we suddenly decided to stay for one more night in Tehran. But our local friend, Mostafa, insisted that he would find someone who can host us. In the evening, we were brought to his friends’ house. Despite the fact that they could speak little English, they welcomed us and made sure we were comfortable. We had one of the most memorable times in Iran! We took a super early bus from Tehran to the city of Kashan, a small city located within a short 3-hour drive from Tehran. 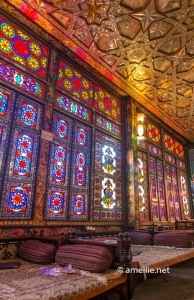 Our main purpose of going to Kashan is to visit Abyaneh. To make our life easier and to save time, we decided to hire a guide that can bring us to Abyaneh and drop us off in Isfahan for USD 50. 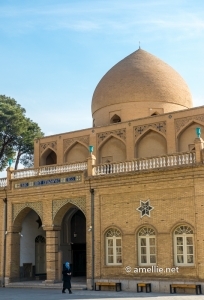 I contacted the guide I found online, made some arrangements, and he picked us up in Kashan. 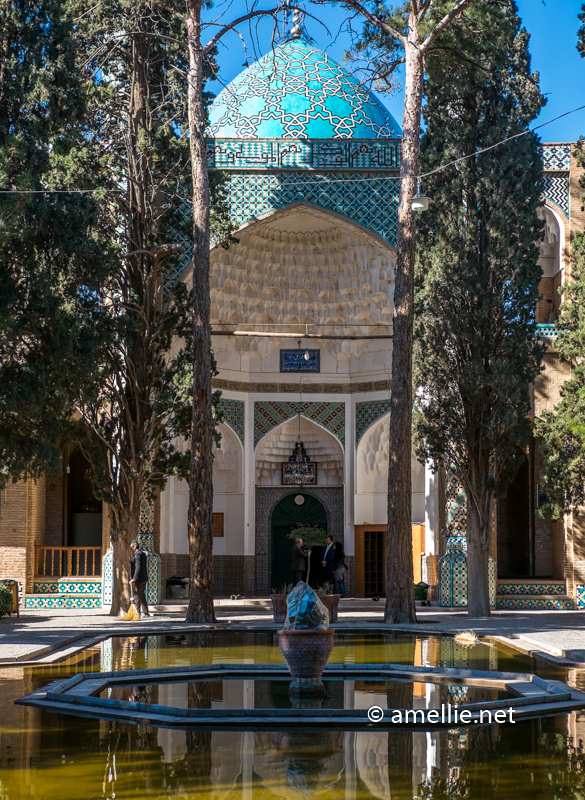 Our first stop was the Fin Garden, a beautiful garden located in Kashan. 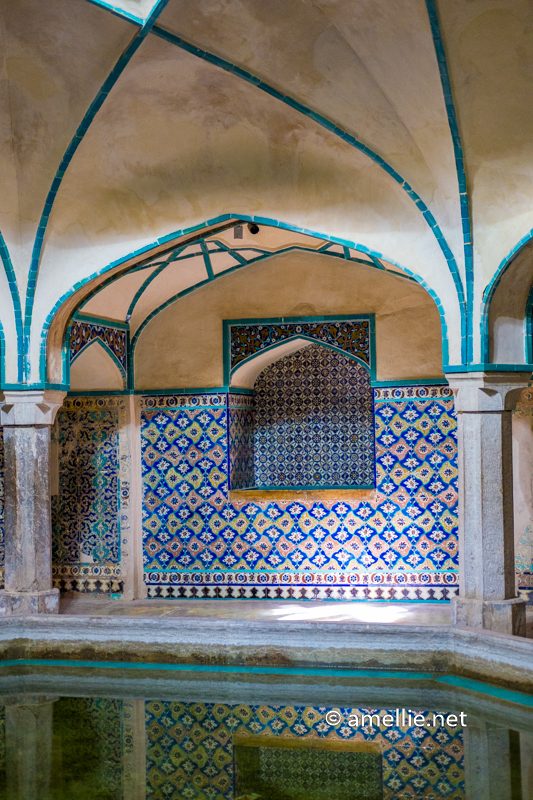 It is the oldest surviving garden in Iran, which features a pair of 400-year-old cypress trees and water fountains with amazing architectural wonders. The two pavilions have glamorous painted ceilings, with water flowing through the ground floor. The entrance ticket was a bit too much and I wasn’t happy that we had to pay 200,000 rials (USD 6.2) per person for this! 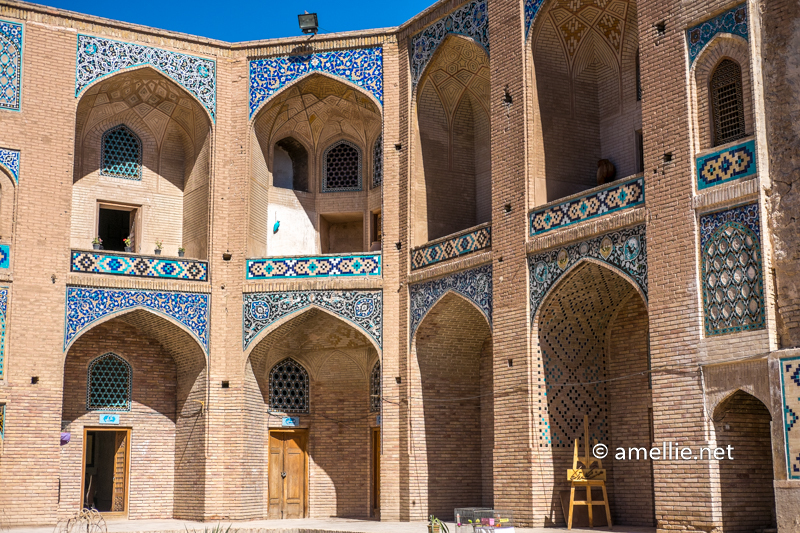 Abyaneh is a stunning ancient village located between Kashan and Isfahan. I didn’t go to this village when I went to Iran in 2011. So I decided to go there this time. I’m so glad we managed to go here. It is the most beautiful village I’ve ever been! 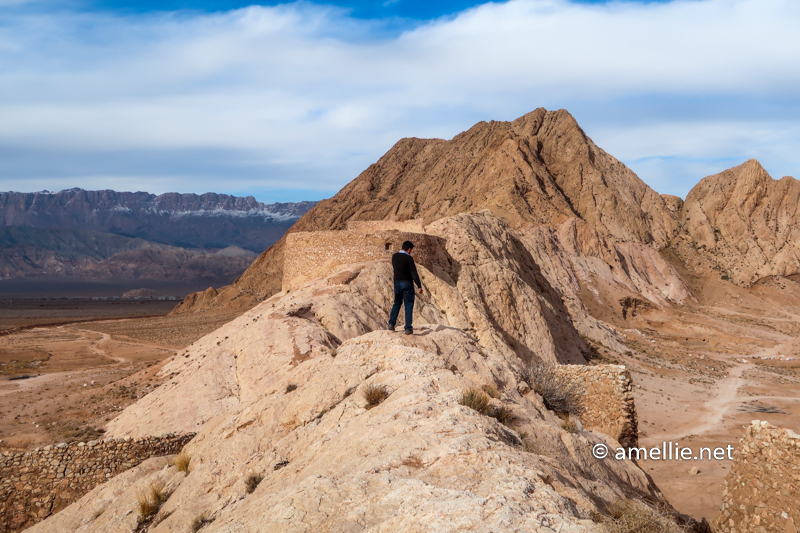 It is also one of my favourite panorama view that I can find in Iran so far! By 5 pm, we reached Isfahan. Our CouchSurfing hosts were Mohsen and Shekoofeh, who hosted us for the next few days in this city. 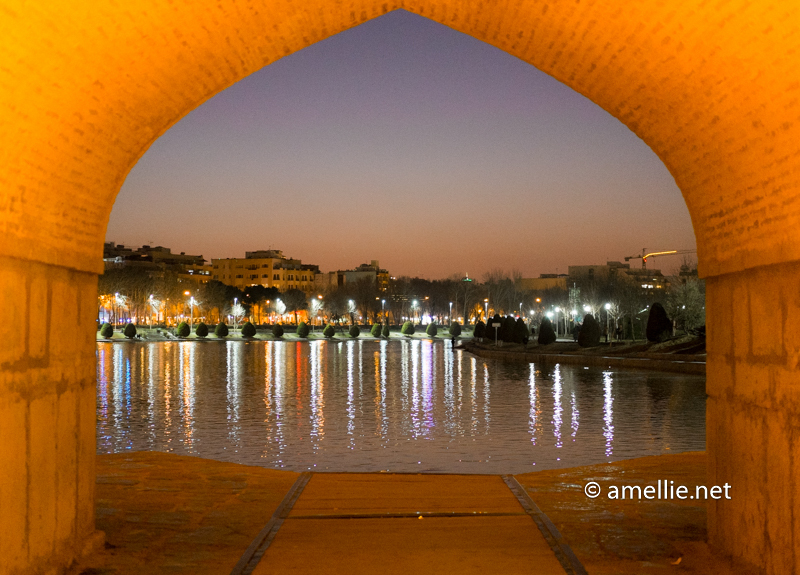 They brought us to the Imam Square and Khaju Bridge at night. We also went to the mall to buy SD cards as we were running out of them! 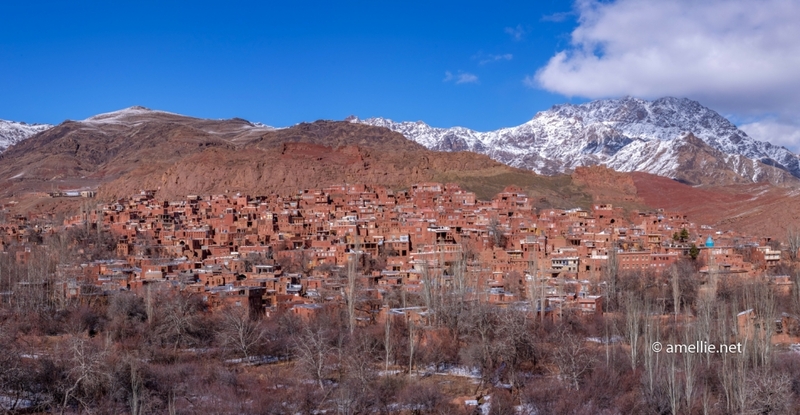 Every corner of Iran is picturesque, so we definitely need more SD cards! We started our day visiting the Imam Square, where we were “swarmed” by school kids who wanted to take pictures with us. 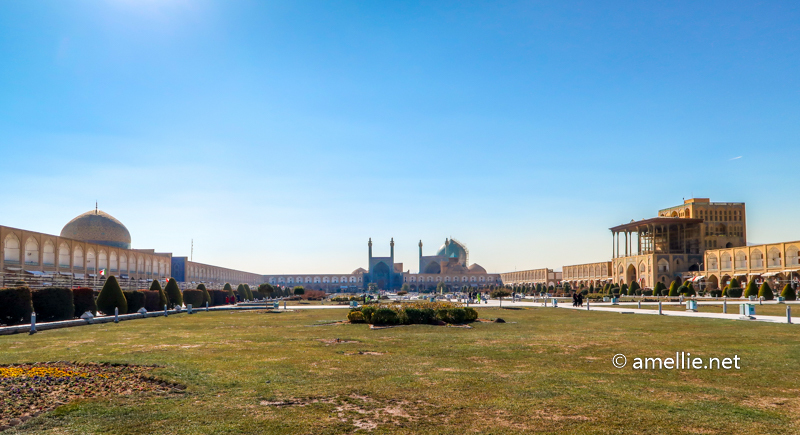 It’s a huge square that has become a primary symbol of Isfahan. 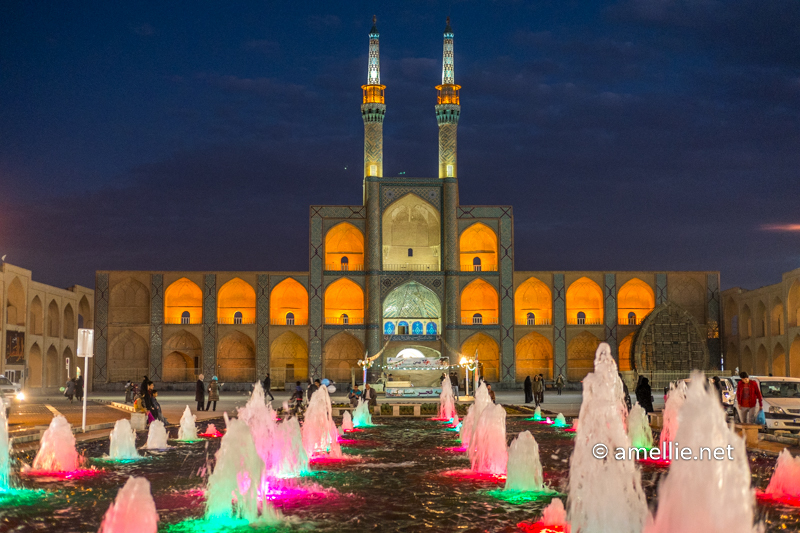 This is what Isfahan is generally known for. Spend a bit of time by just sitting there and people-watching. 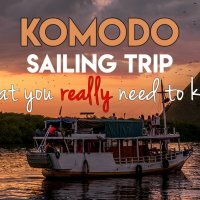 You will be surprised that locals would actually come to you and say hi. Who knows, you will be making new friends? The Imam Mosque was our next visit. This is one of my favourite mosques in Iran. Just like what I did on my previous trip to this mosque, I sat in the middle square of the mosque, enjoying the serene and peaceful feeling of this mosque. We ordered a must-try traditional Isfahani food, called Biryani. Isfahani Biryani is not the same as the one that you find in India. It’s not served with rice. It comes with a huge bread, pieces of brains, and minced meat. 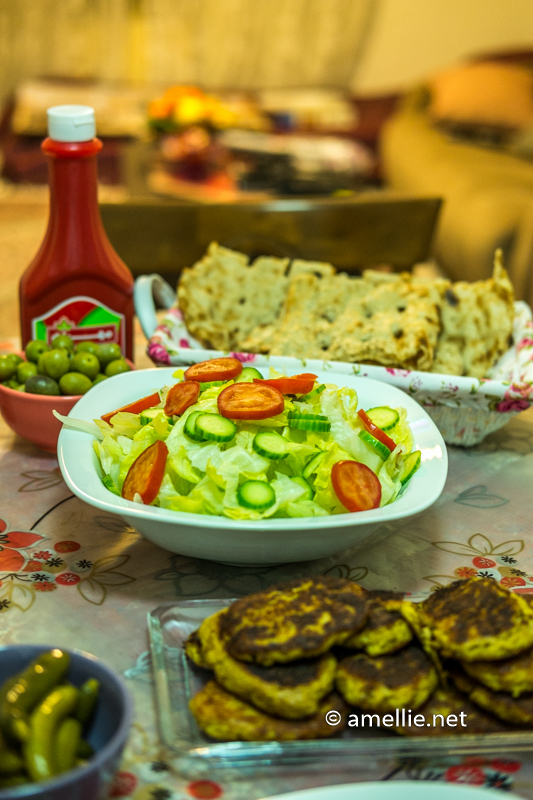 It’s the most delicious and my most favourite dish in Iran! I just LOVE it! Late at night, we had a barbeque with our host Mohsen and Shekoofeh at their apartment. With our help, they prepared chelo kebabs (chicken kebabs) and grilled the kebabs at their balcony. Iranians love their kebabs so much, don’t they? I love the home-made kebabs, tastefully coated with saffron and other spices that are not so common in Southeast Asia. We had such a great time with Mohsen and Shekoofesh that we didn’t feel like leaving their house at all! He even told us that we could stay for one month if we really want. Hahaha. 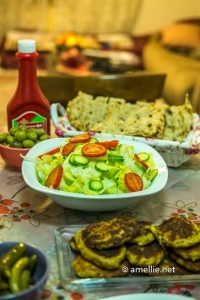 Our stay in Isfahan would not be the same without them! After yet another delicious breakfast with Mohsen and Shekoofeh, we went to the 33 Bridge, the longest bridge on the Zayandeh River. Mohammed, whom we met yesterday, accompanied us throughout the day. From the bridge, we walked to the Vank Cathedral, a famous Armenian cathedral built in 1606 for the Armenian refugees affected by the Ottoman War. The architecture design of the church is a blend of Armenian and Iranian design. It has a golden interior view, which was impressive and well-kept. The entry ticket costs 200,000 rials (USD 6.2) for foreigners. After spending a few hours at the cathedral, we went back to the Armenian Quarter and had late lunch at the Bastani Traditional Restaurant, another famous restaurant at the Isfahan Bazaar at Imam Square. We ordered yet another biryani, as I just could not get enough of it! In the evening, we went to the Khaju Bridge again to meet Mahdi and his family. My travel mates and I used to stay at his house during our travel in 2011. We had a quick conversation and took some pictures. The wife gave us a nicely packed food to eat on our bus ride to Yazd. It was such a nice gesture — Iranians always blow me away! 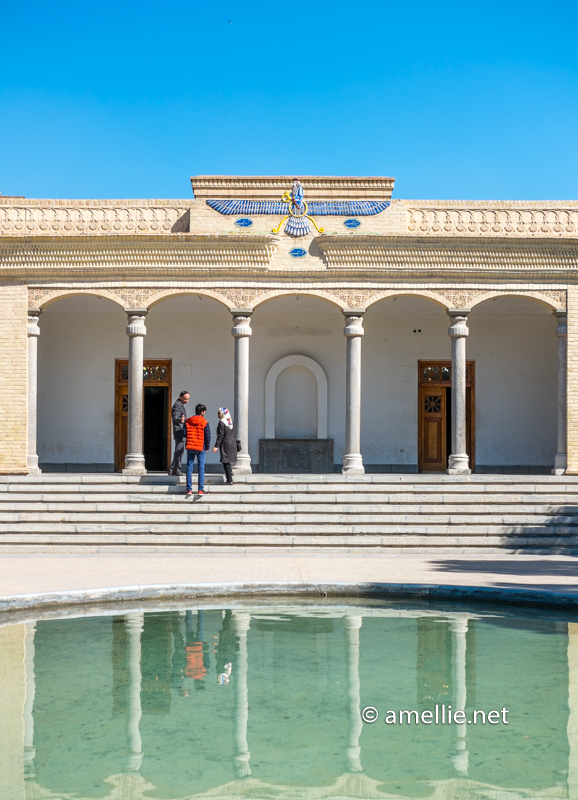 As we spent most of our time talking to the locals, we skipped some of the important places, like the beautiful Ali Qapu Palace located in the Imam Square (entrance: 200,000 rials or USD 6.2 for foreigners). If I were to go here again, I would probably spend one more night in Isfahan and go to Varzaneh for a day trip (or stay there for a night) to see the beautiful desert. Our plan was to go to Yazd with a night bus so that we can save time and money. But our host Mohsen insisted that we stayed for another night; thus allowing us to have a good rest before starting our day in Yazd. At 5.45 AM in the morning, we took a bus to Yazd, passing through a vast desert with a backdrop of a snow-capped mountain range. It was a beautiful journey. We arrived in Yazd at 11 AM. A driver from the hostel, that was arranged by Mohammed yesterday, picked us up. After that, we spent most of our lovely day with Jamileh, a girl I met on my previous visit to Yazd, as well as her parents. Jamileh dropped us off at the historic Dowlat Abad Garden. 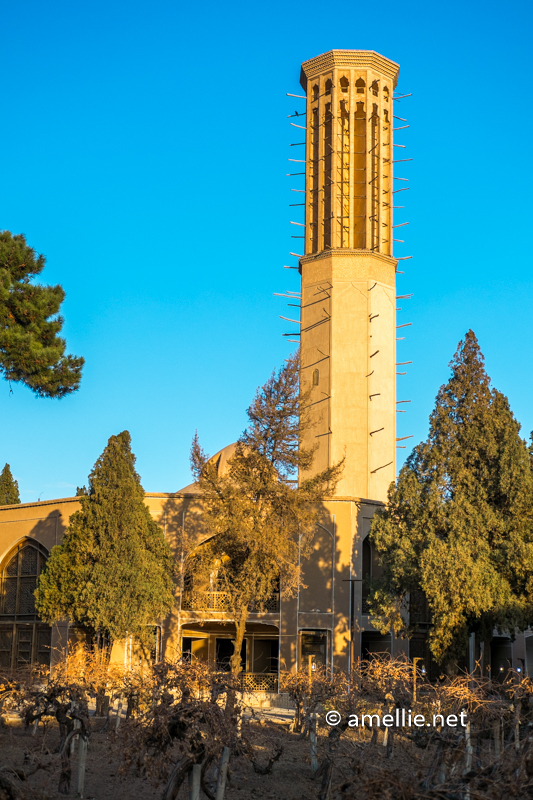 Built in 1747 during the Zand dynasty, the garden hosts the tallest wind tower in Iran, decorated with colourful mosaic windows that reflect light in the morning. Is it worth paying 150,000 rials for this? IMHO, I don’t think so. There is not much you can do or see around the garden anyway. 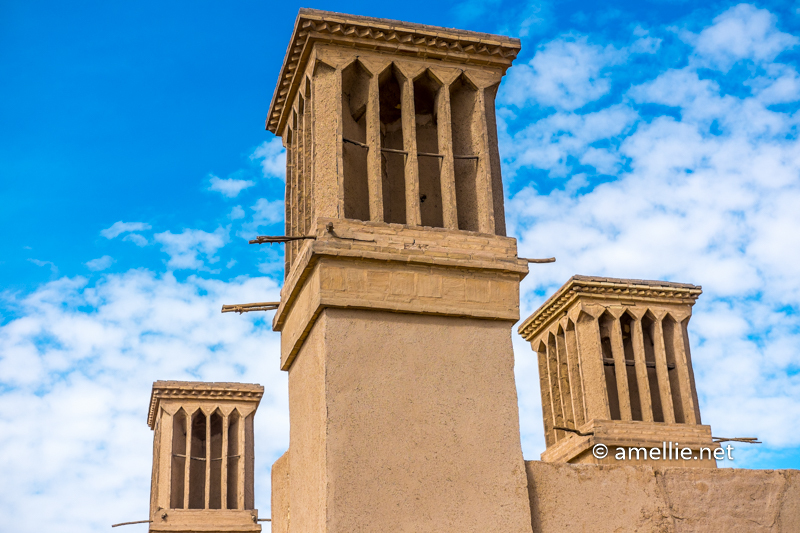 We came back to the old city of Yazd to explore the Amir Chakhmaq Complex and the small alleys of Yazd. Then we had a cheap but delicious dinner at a humble kebab stall located beneath the Amir Chakhmaq minarets. Not to mention that this historical building looks more beautiful in the evening! The colourful light and the water fountain in front of it make the minarets look more dramatic. 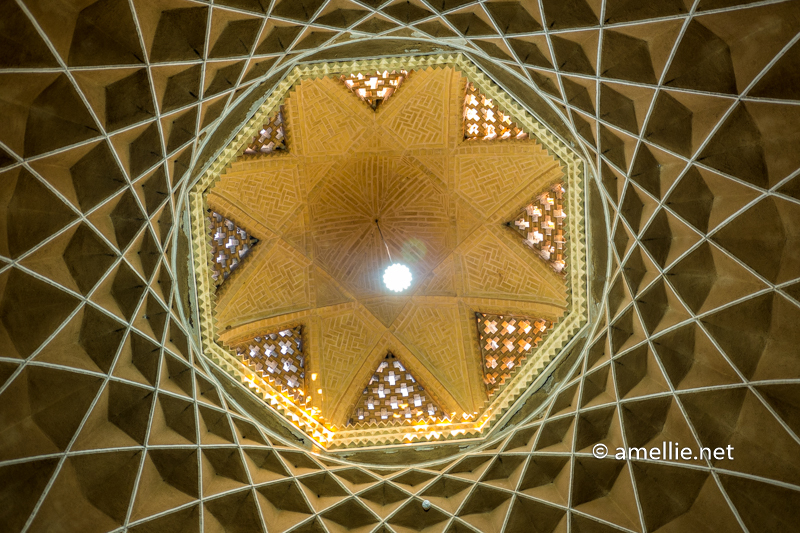 If you are not going to Kerman, then a visit to the Zoroastrian Towers of Silence in Yazd is a must. It is a place where Zoroastrians exposed their dead to the vultures, as they believe that earth is pure and it should not be polluted with human corpses. It costs 80,000 rials (USD 2.5) for a foreigner to enter. You can reach the place by taxi for 100,000 rials or yellow bus for 50,000 rials. Our first activity in the morning was to visit a carpet shop, where were could go to its rooftop for free. The rooftop was very spacious and the view was AMAZING! 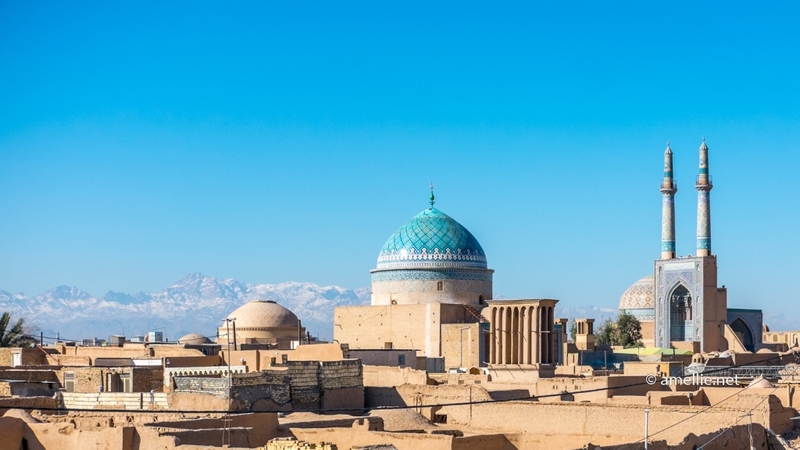 You could see 36o degree view of Yazd with a snow-capped mountain on one side, and desert mountain on the other side. I love how the wind towers decorate the whole city into a unique Tatooine-like old city. Impressive is the word I can tell you! 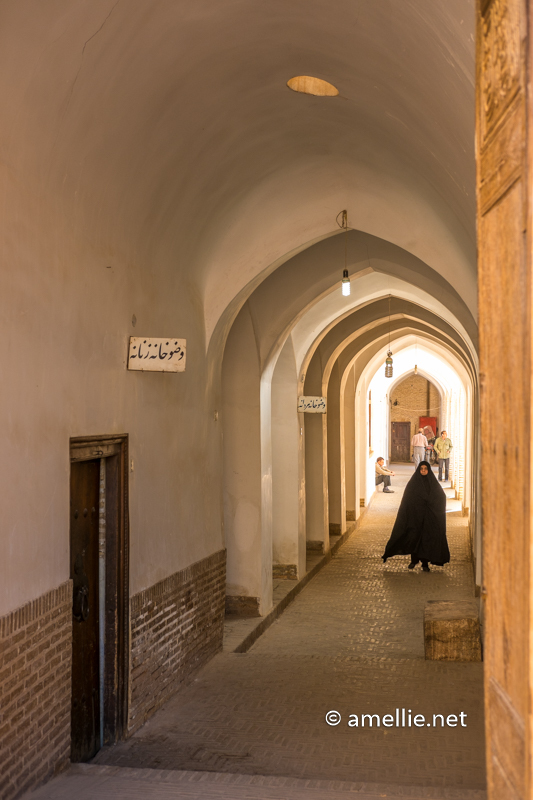 We also explored the small alleys of Yazd (again! Coz I could not get enough of it!!) and the Jame Mosque. You need to pay to enter the mosque, but somehow we entered from the back and no one actually guarded. The Fire Temple is a must-visit temple when you are in Yazd. This is where we can learn more about the ancient monotheistic religion of Zoroastrian. There are still a handful of Zoroastrians in the world, including in Iran and India. For them, fire and water are the elements of purity. The temple hosts the fire which is believed to have been burning since 470 AD. The entrance ticket is quite cheap: 80,000 rials (USD 2.5). After visiting the fire temple, we decided to go to Kerman earlier. We took a bus to Kerman at 4 pm and met our friend Amir who brought us to Mahan. We didn’t know what to expect out of this visit and that’s when Amir laid out the plans for us. It turned out that he had arranged some activities for our stay in Kerman for free! On top of that, we got to stay at his beautiful guest house in Mahan, where we were the first guests. We could not be happier!! We were picked up by our guide Mahmood in the morning to visit two main attractions in Kerman. The guide was provided for free by our friend Amir — it was our lucky day! 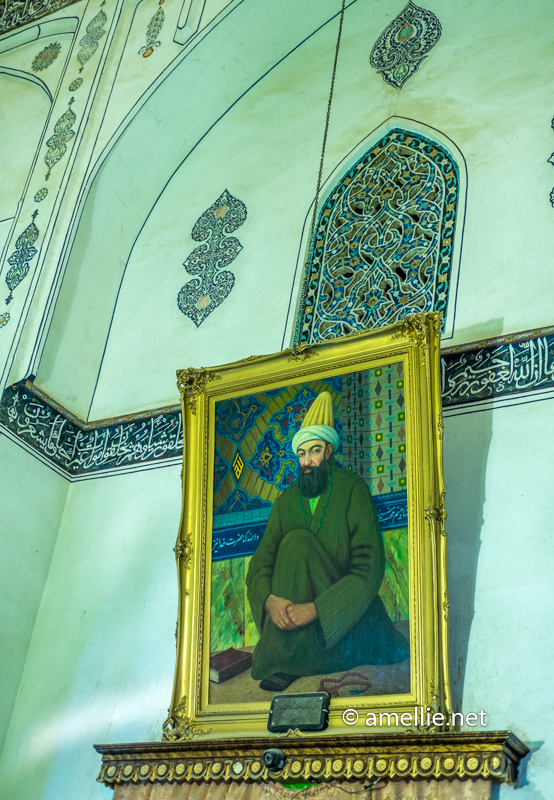 Shah Nimatullah was a Sufi Master and poet from 14th and 15th centuries. He is revered by Shi’a as a saint. Hence, his shrine, which was built 5 years after his death and located just next to our guesthouse, became a pilgrimage site. The shrine complex consists of a garden, a mosque, and his tomb. Unfortunately, the entrance cost of 150,000 rials (USD 4.6) is expensive. I have been to a few gardens in Iran. On my previous visit to Iran, I went to some of them in Shiraz and on this trip, I visited the garden in Kashan. I have to say that, compared to these gardens, nothing were as beautiful as this particular garden in Mahan. Shazdeh Garden has an impressive water cascade feature, which allows the water to flow from the upper ends towards the lower ends. The water itself comes from the nearby mountain. It’s astonishing to know that the water flows without the need of mechanical water pumps. After visiting the two attractions, we decided to stay in our room and sleep the whole day! We didn’t have enough sleep these few days, so this was our time to have a complete rest. It was the most relaxing moment ever since we arrived in Iran a week ago. After a good whole day of resting the previous day, we started our busy activity again. 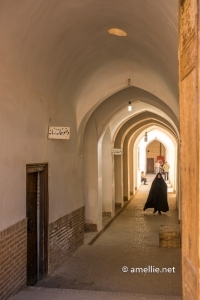 This time, we were picked up by our guides, Mostafa and Kiyana to explore Kerman. This Safavid-era complex was named after the governor of Kerman, Ganj Ali Khan under the Safavid rule. 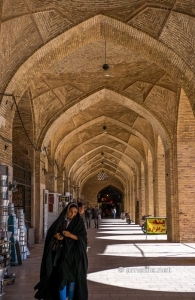 The complex consists of a bathhouse, a caravanserai, a school, and a bazaar (among other things!). 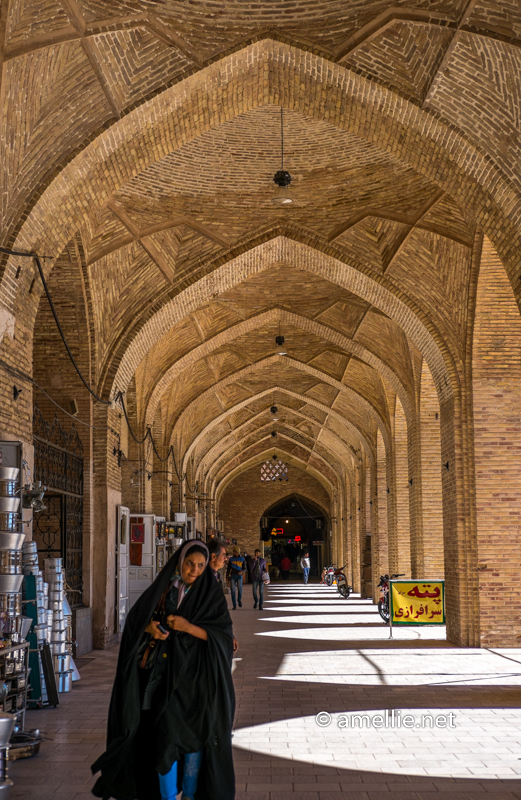 The bazaar is the longest bazaar in Iran and it’s selling traditional goods, unlike the one in Esfahan. 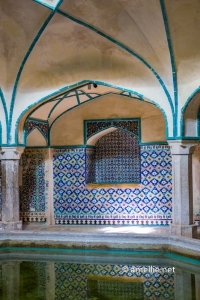 This is actually a traditional tea house which used to be a hammam (bathhouse). It had a nice atmosphere, with live traditional music playing in the background. It was the perfect place to get ourselves recharged again! Moshtagh Ali Shah was an 18th-century Sufi mystic. He is also known as a musician who introduced the fourth string on the setar, an Iranian traditional three-stringed guitar. Unfortunately, he was stoned to death in the Jame Mosque by the religious people after catching him singing some verses of the Qur’an to the tunes of his setar. 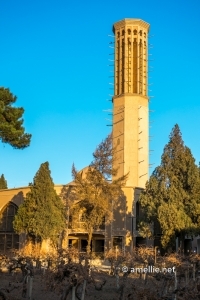 Built during the Qajar period in the 19th century, Moshtaghiye hosts the tombs of major Sufis, including Moshtagh Ali Shah. 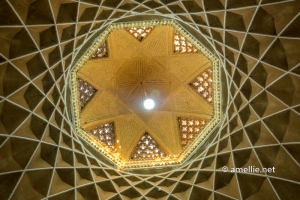 Located near the bazaar, Jame Mosque is the main mosque of Kerman. 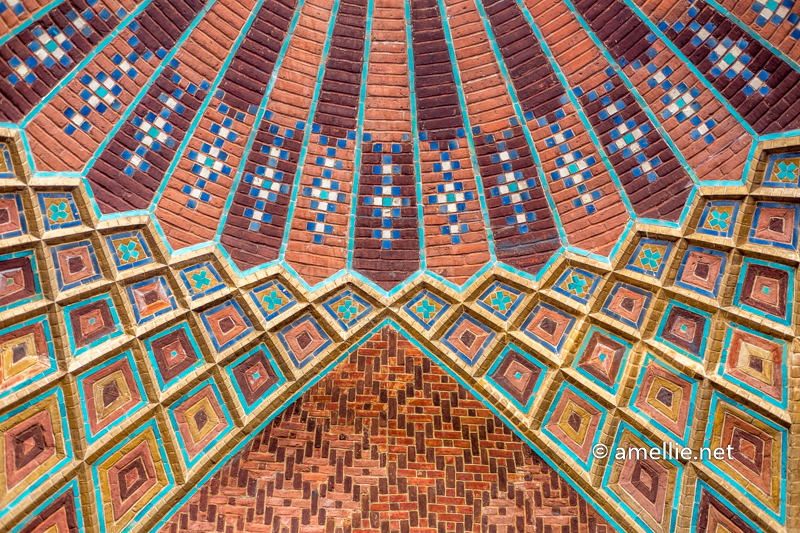 Compared to other mosques in Iran that I’ve visited, it has some unique features: a clock at the top of the iwan and beautiful tile works. 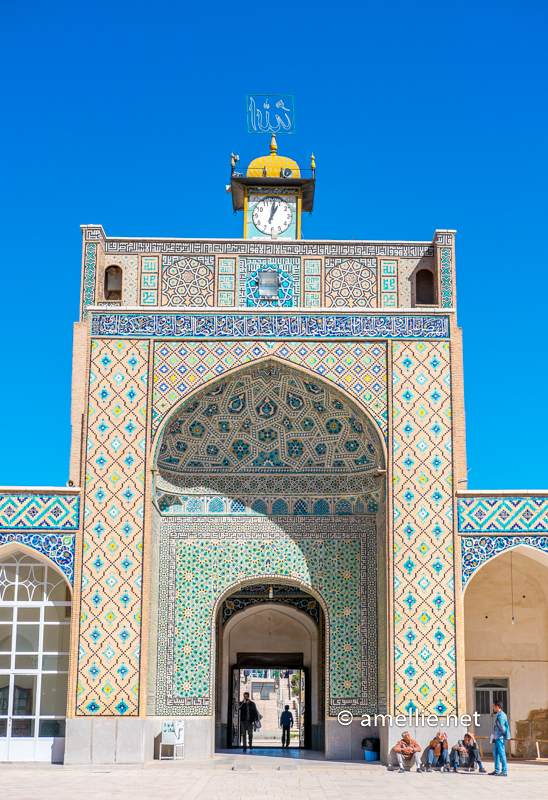 Just like the Sheikh Lotfollah Mosque in Esfahan, Jame Mosque does not have minarets. One of the highlights of our visit to Kerman was definitely the Zoroastrian Tower of Silence. Just like the one in Yazd, this is the place where they laid their dead to be presented to the vultures. Unlike the one in Yazd, though, this place is located on a hill with a 360-degree view and it is almost completely deserted! There were no tourists and there were still some human bones lying around. We could even find a human tooth here. I have to say, this is by far my most favourite place I’ve ever been to in Kerman. Hands down! 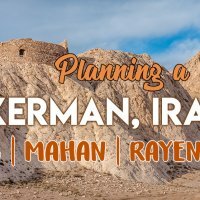 We decided to stay at the Akhavan Hotel in Kerman so that we could go to Rayen and Kaluts. 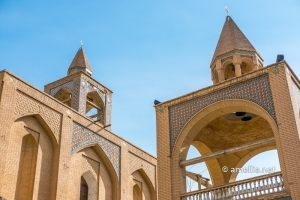 To my knowledge, they offer the best and cheapest private tour in Kerman. With only USD 45 per taxi, we were able to go to Rayen and Kaluts. Note that the distance between these two places are very far and I don’t really know how the made money out of this. Early in the morning, our taxi driver from the Akhavan Hotel picked us up to go to Rayen and Kaluts. In the beginning, we wanted to go to Bam, but after looking at the before-and-after-the-earthquake photo, we decided to skip Bam and go to Rayen instead. The medieval mudbrick city of Rayen is believed to have existed since 1,000 years ago. It was situated on a trade route, where high-quality textiles were traded. Unlike Bam which was completely destroyed, Rayen was very well-preserved. The citadel of Rayen looked “too nice” that it didn’t feel medieval at all. It was a great experience to explore every nook and cranny of this medieval city, though. We could even climb to the top of a building to see the whole view. It was definitely worth paying 150,000 rials (USD 4.6) for the entrance ticket! Kaluts, otherwise known as the Lut Desert, is the world’s hottest place, with a temperature that can reach as high as 70 degrees celsius in the summer. 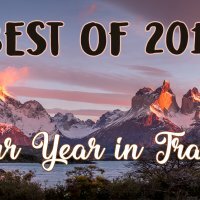 It is also one of the driest places in the world. To go to Kaluts, we passed through a mountain pass, covered with complete snow and within few hours, we were at the hottest place on earth! Amazing, isn’t it?! We managed to see the sunset at Kaluts, but I wish I could spend more time here before the sun disappears. I also wanted to take pictures of the stars, but the full moon lit up the dark sky, so I was not able to take proper starry pictures. Anyway, after dinner, we took an 8-hour night bus to Shiraz. Bye, Kerman! You’ve been treating us so well! 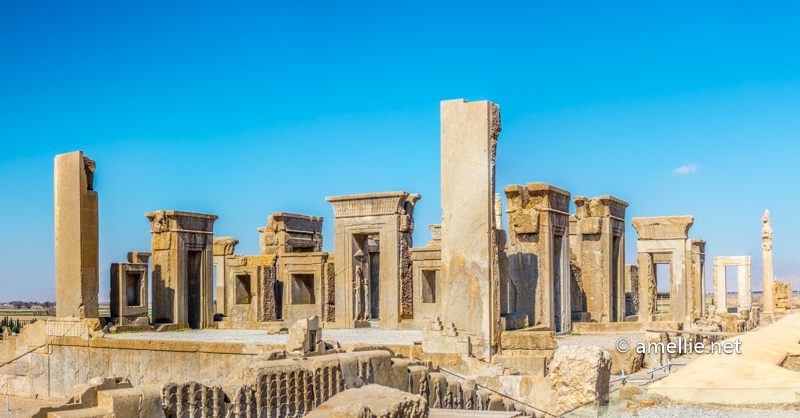 Upon arriving in Shiraz, our guide, Peyman, picked us up at around 9 AM to visit one of the highlights of our trip: Persepolis, the ceremonial capital of the Achaemenid Empire. The details of the bas-relief and the carvings were mind-boggling! It’s hard to appreciate the ruins of Persepolis without having a guide who has a vast knowledge of this area. The stories behind the diversity and multiculturalism of the ancient Achaemenid Empire impressed me the most. We also went to the Naqsh-e Rustam, otherwise known as Necropolis, where the four tombs belonging to the Achaemenid kings are carved out of the rock face. By 2 pm, we reached our hostel, Golshan Traditional Hostel in the centre of the city. We had lunch at a cheap traditional restaurant deep in the bazaar. After that, we booked a train ticket to Tehran at one of the travel agencies in the city. From the centre of the city where our hostel was located, we decided to walk all the way to the Tomb of Hafez. It was a long walk, but we loved it as we could explore every corner of the city. 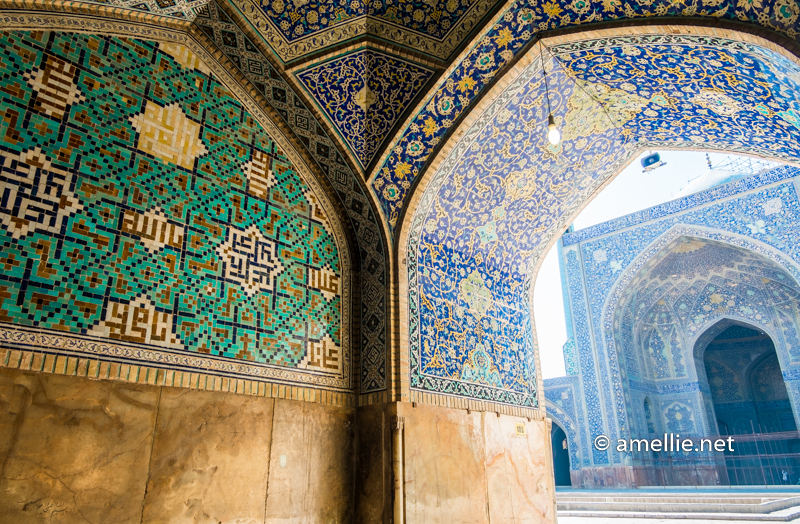 Hafez is a famous Persian poet that has a huge influence to Iranians’ day to day lives. It’s said that every Iranian own a book of Hafez. That’s how important he is! 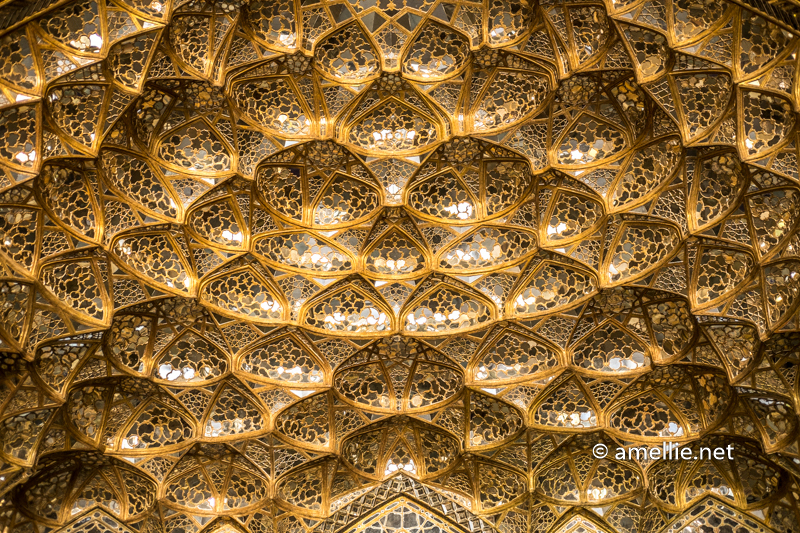 The tomb itself is located inside a pavilion with a beautiful ceiling. The entry ticket was over pricey, though! For such a small place, it’s the same price as Persepolis, which is 200,000 rials (USD 6.2). I don’t understand how they simply put these prices! We woke up early in the morning to go to the Nasir al Molk Mosque. 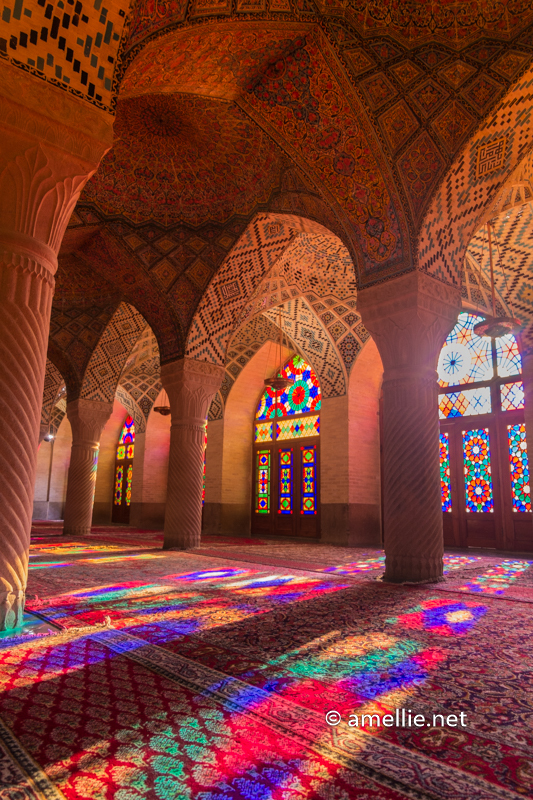 The mosque has stunning colourful glass windows that reflect light in the morning. 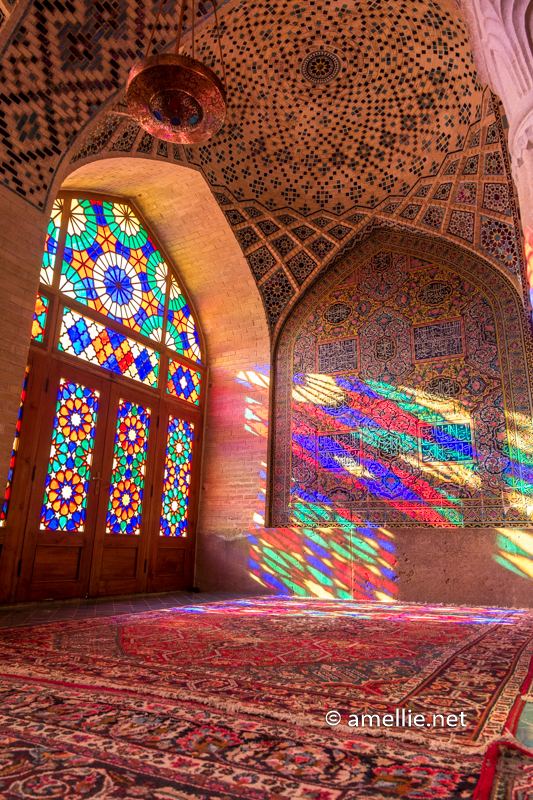 The light reflection creates this beautiful colourful light over the tightly woven Persian carpet. To see this reflection, you need to come here in the morning (until 11 am). The earlier the better so that you can avoid a group of organised tours that can disturb the serene surrounding. 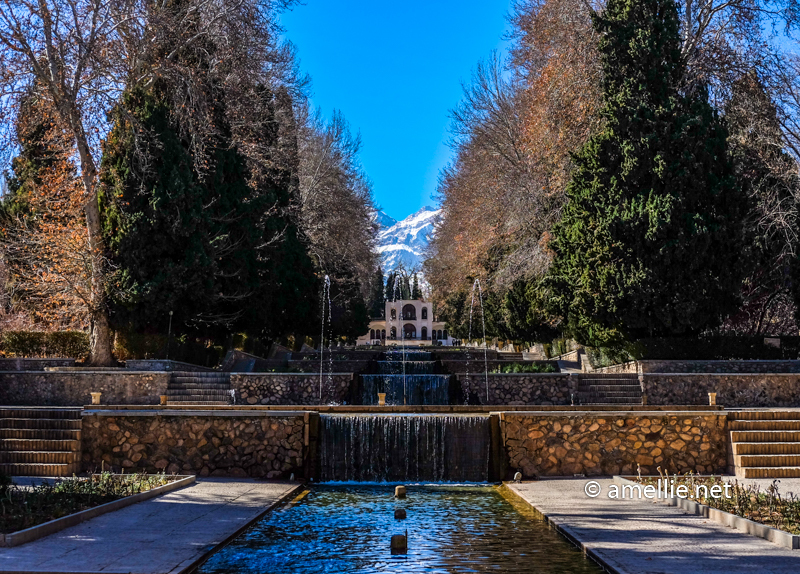 There are many places that you can visit in Shiraz, including the beautiful Eram Garden. I went to this garden in 2011 and I still think that Shazdeh Garden in Mahan is more beautiful. 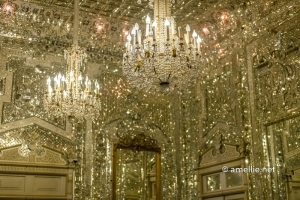 There are also Shah Cheragh Mausoleum, Vakil Mosque, and many other places. I would suggest visiting places in other cities (example, Imam Mosque in Esfahan) as they are much better than the ones in Shiraz. After having lunch at yet another cheap and random eatery in the bazaar, we checked out of our hostel and took a taxi for 150,000 rials to the train station. Our train departed at 5.40 pm and it was a very clean and comfortable sleeper train! I imagined the train to be super old, almost Soviet-like train, which I took during my 2011 travel. This feels like a VIP train ride! We arrived in Tehran in the morning after 16 hours on the train. Our purpose to go back to Tehran so early was because we wanted to hike Mt Tochal (instead of taking the pricey gondola). Unfortunately, it was raining for the whole day, so we decided to check into a budget hotel and stay indoor instead. We had to cancel the hike due to the bad weather. In the evening, we went to visit Hoda and Ali, who hosted us 2 weeks ago. We talked and laughed until we didn’t realise the time! We missed the last train/metro and had to take buses (BRT) to go back. On our last day in Tehran, we went for shopping in Tajrish Bazaar. The bazaar is much less crowded than the Grand Bazaar so I could find the things I needed peacefully. But it is smaller than the Grand Bazaar and I am not sure if the price is more expensive, or cheaper than the ones you can find in the Grand Bazaar. Our flight back to KL was in the evening and we decided to go by metro to the station closest to the airport, which is the Kahrizak metro station. From here, we took a taxi for 200,000 rials (USD 6.2). For our 15-day trip in Iran, we spent a total of USD 1200 (USD 600 per person! ), not including the flight tickets (AirAsia ticket costs additional RM 1,200/USD 279 per person return). We didn’t try to restrict our expenses, especially for our meals. So we could definitely bring the cost down! Also, bear in mind that we stay with locals (CouchSurfing) most of the time, cutting the costs of accommodation for much of our stay in Iran. Some of the ticket entrances in Kerman were paid for as our friends insisted on paying. If you go to Iran, you will realise that most of your expenses are mainly for the accommodation, attraction visits, and transportation. To me, attractions are the ones that can explode your wallet. So you gotta be careful and plan well on what to visit, instead of visiting all of the attractions! *Prices below are per person unless otherwise stated. Moshtagh Ali Shah Tomb: ? In a less fancy eatery, it can cost 150,000 rials per person or less, depending on what you order. I’m sorry contacting you for ask such things, but.. i’ll arrive in tehran in 12 november at 1:00 and i’ll leave iran in 25 november 15:00 from Shiraz. Its… 12 ou 13 days there and i really appreciate if you could tell me if my itinerary is plausible.. or if you change the number of days in any of these cities below. Hello Dilson! Yes, your itinerary sounds ok. Enjoy Iran! 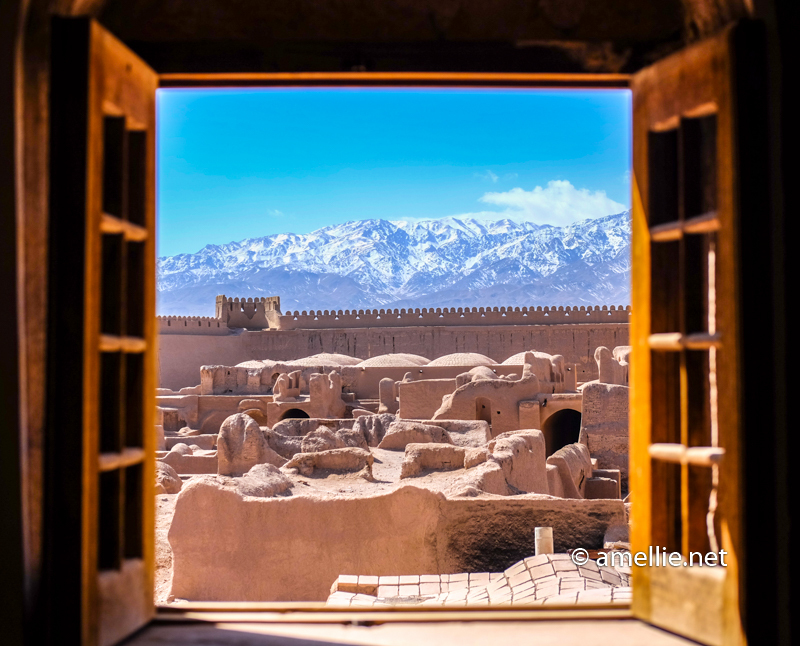 Great post amalia,really help me to plan my upcoming trip to iran.. anyway do you mind to share what camera you used,great photo and video. Thank you, Hafizah! 🙂 I use an old Fujifilm camera that has been with me for 4 years (Fujifilm XM-1). My husband uses Canon G7X Mark II for his videos. Hi sis. Thank you for ur sharing. I surveyed for Necropollis tour and most of the guide give me 100euro for 2per. Is the rate is normal and affordable? Hi Farida. If the tour includes visiting Persepolis, Necrepolis, AND Pasargade then it is normal. Pasargade is quite far from the two sites. However, if it only includes Persepolis and Necrepolis it’s too much. I paid only USD 45 for the tour. You can check my blog on Persepolis for the contact details of the tour guide. Hi Amalia, I’m so happy that I’ve found your blog. I’m going to Iran on February and I’m very excited. 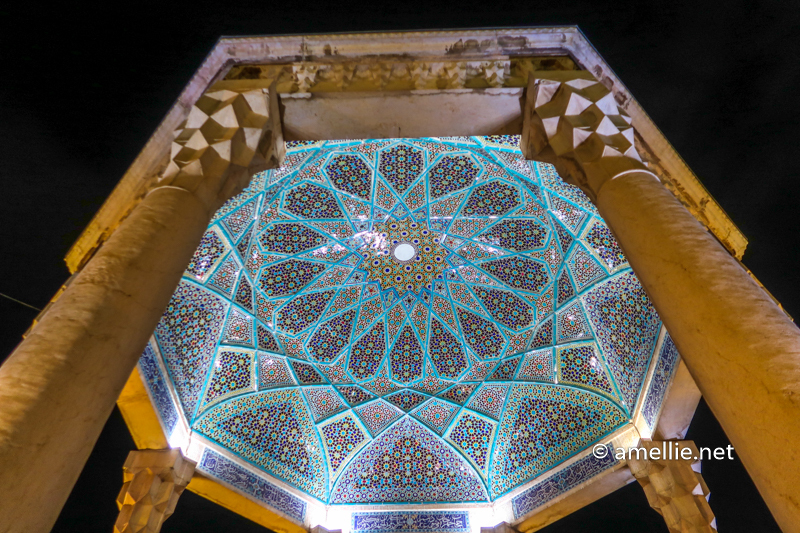 Did you have a guide while in Shiraz? I would like to have a guide especially for Nasir al Molk Mosque as I would love to get to know about it. Thank you very much! Hi Anne! I didn’t hire a guide when I was in Shiraz. You can probably contact my guide for Persepolis and see if he can arrange one or if he has a friend who can do it 🙂 enjoy Iran!! Hi Amalia. Awesome post. Full of incredibly useful information and stunning photos. Now to lock in a time for a trip to Iran. Thank you.